I read this book for the first time a few months ago and was surprised at how modern it seemed. The writing was crisp and quick, with short paragraphs and chapters; and while the vocabulary was definitely from its era, it didn’t feel dated like so many classic novels do. It was a rip-roaring adventure that I greatly enjoyed. Aye, it’s very accessible even completely unabridged. That’s an effect of RLS’s beautifully clear writing. Much as I love George MacDonald and Dickens other more baroque writers of that age, it’s true that they can sometimes be hard to read. I haven’t had that problem with Stevenson yet. Even the professor for my college writing class (the good one) used Stevenson as an example of how to write really clearly and efficiently while still being creative. Great great review! I haven’t read this in ages and it’s never crossed my mind as something that would be a good re-read. I love the illustration by N.C. Wyeth. The edition of The Adventures of Robin Hood I recently finished used Wyeth’s work. The man was amazing! They really are masterful illustrations. I’ve only seen a few of them, but they suit Stevenson’s stories very well, since both of them burst with colorful adventure while still showing it in fairly realistic light. I agree that the writing triggers the imagination of the reader. I was also quite excited in the first pages of the book — but it turned out that my interest would only be on the first pages. I don’t know. I actually thought that the story would be an adventure into the sea. The beginnings hold such promise. But in the middle to the end it turns out to be a battle between pirates and stuff like that, which is kind of disappointing for me. But the iconic pirate characters are commendable though. I suppose if you’re expecting ship-to-ship combat and lots of swashbuckling, you might be disappointed. But the subject is rather in the title: an island on which there is treasure, and the effects that the search for said treasure has on the characters. I guess I felt that it *was* an adventure into the sea, but it didn’t stop there: it took us to a particular place in the sea and explored realistically (but also entertainingly) how these characters are stripped to their core natures and values. 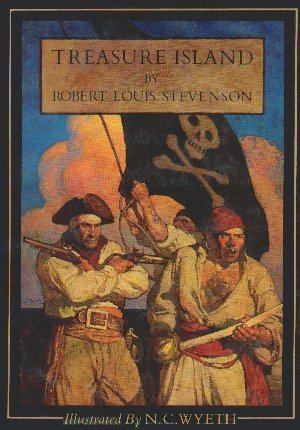 I felt like a kid again while reading it, for all the action and adventure (attacks on a stockade! sneaking out among the enemy at night! Jim taking over the Hispaniola singlehandedly!). And yet it wasn’t just a simplistic sort of cartoon: it filled its characters and situations with fascinating depth, feeding my adult mind. I love stories that do that! Thanks for the comment. Your review is also good — even if we disagree somewhat on the direction of the story. That’s fine – what matters more than a subjective opinion is *why* we hold such opinions. I think you explained your reaction to the book quite well. If you’re looking for a more action-packed classic adventure, I might recommend “The Prisoner of Zenda” by Anthony Hope. It doesn’t have pirates, but it does have castles and intrigue and a fair bit of swordplay. And a pretty epic final action/battle scene. Despite its 1894 publication date, it reads like a great Hollywood movie. although i also hvn’t read this book..bt i was serchng for book review to speak in school assembly..its really helpful nd awsme..
wonderful book which i love the most.book review fr this book is very amazing. It’s also rollicking. And swashbuckling. It is awsome. It is amazing because it has adventure. I like it very much.